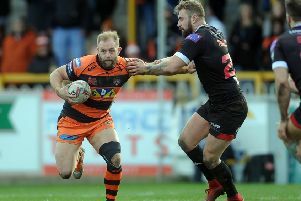 Director of rugby Jon Wells is hoping the possibility of regular games will bring Kieran Gill on as a player and help him to eventually become a regular for his hometown club, Castleford Tigers. Gill, 22, who has made four first team appearances for the Tigers in the last two seasons, is joining Newcastle Thunder on a year-long loan. Castleford will hold the option to recall Gill back from his loan once the first 10 weeks have past if they require his services and hope he will see regular action with the League One club. Wells explained: “This move is a massive opportunity for Kieran to play regularly, which he has not been able to do in 2018. “The step-up for our young players represents a high bar – we are a top four team, which makes the standards and expectations required to make the transition into a starting 17 player that much tougher. Gill said: “I’m really grateful for the opportunity with Thunder after a tough year last year and I’m looking forward to getting back to what I do best, with a team pushing for promotion. It’s something that I am very excited to be a part of. “Coming back from a major injury was tough mentally and physically, but I grabbed every opportunity I got with Cas and I thank them very much for that. Gill made his debut for the Tigers in 2017 against St Helens at the Mend-A-Hose Jungle, scoring a try before picking up a serious knee injury that kept him out of action for close to a year. After his recovery, the winger or centre played in three more games for Castleford in 2018, scoring three tries while also playing three games for Oldham RLFC and once for the Thunder against Bradford.